A Groundwater Heat Pump system works by recovering heat stored naturally in groundwater or aquifers. The water passes through heat pumps to yield its low grade heat before being returned to the aquifer at a lower temperature. The Energy Secretary has described water source heat pumps as "game changing" in relation to Britain's need for renewable energy against the backdrop of insecurity in Russia, which supplies much of Europe's gas, and the political row at home over soaring fuel bills. BEIS has drawn up a Water Source Heat Map showing where renewable heat can be drawn from water to exploit the potential of heat pumps. Any large body of water, including tidal rivers as well as standing water can be used. The Government has a target of 4.5 million heat pumps across Britain. The late Sir David MacKay, the chief scientific adviser to Government and professor of engineering at Cambridge, has described a combination of heat pumps and low carbon electricity as the future of building heating. 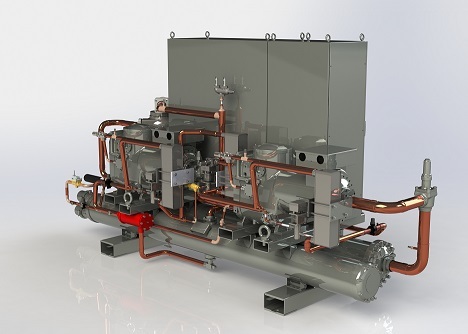 A heat pump can concentrate heat by compressing refrigerant gases into a small volume and then transferring the heat into buildings to provide warmth via heat exchangers. The refrigerant gas becomes cold when the pressure is released and this coldness can be exchanged with warmer water from the aquifer – and the cycle can be repeated continuously. The effect is to transfer heat from the aquifer into the building. air source heat pumps, which heat exchange with ambient air, are cheaper to install than ground source heat pumps, but they are at their least efficient on the coldest days when they are most needed. The aquifer is warmer than the air in winter, so a groundwater heat pump is more efficient than an air source heat pump – because of the thermal inertia of the water from the previous summer. The ground is also warmer than the air, so a ground source heat pump is also more efficient than an air source heat pump – because of the thermal inertia of the ground from the previous summer. Water has a high capacity to hold heat in relation to its volume; it readily absorbs heat and readily delivers it: it enjoys a high transfer rate. It is more efficient for a heat pump to exchange heat with water than air – which enables a water source heat pump to outperform an air source heat pump. A ground source heat pump also uses water to transfer heat from the ground to its heat pump. The thermal capacity and thermal inertia of water enables it to retain some of the solar heat gained in the summer through to the winter. Groundwater in aquifers is warmer than the air temperature on cold winter days and thus provides a more attractive input temperature to a heat pump. The London Aquifer maintains a steady temperature of 14°C throughout the year. A well engineered groundwater heat pump system has access to a large volume of water: this enables it to extract heat from a very large heat source whose temperature will not change significantly as relatively small amounts of heat are extracted from it. The disadvantages of an open loop heat pump system include the need to meet the additional engineering challenges of dealing with water which may contain debris, unstable pH values or biological growth and may call for additional pumping loads. It will also be necessary to meet the abstraction requirements of the Environmental Agency on all but the smallest of schemes. The key disadvantage of using a very large body of water to achieve heat exchange with a relatively constant temperature is that you are not able to store summer heat in that body of water – to have the benefit of retrieving those higher temperatures in winter. The CoP of a heat pump will generally improve the lower the output temperature it is designed to deliver: therefore the designer aims for a well designed heat emitter system such as underfloor heating where 40°C is sufficient to provide comfortable temperatures. However, if a heat pump is to be used in an existing building with limited heat emitters for the heat load, such as undersized radiators, then it may be appropriate to specify a high temperature heat pump to avoid the disruption that would be caused by refurbishing the heat emitter system. There are now heat pumps capable of delivering output temperatures of 80°C which is more than sufficient for DHW needs and to warm a building with undersized radiators. Although the CoP will fall if output temperatures are raised to 80°C, a well designed inverter-driven high temperature heat pump with a good control system, including weather compensation, will only deliver 80°C when it is required: otherwise it will modulate the heat pump to deliver lower temperatures – at a higher efficiency – when the heating load is below peak requirements. Groundwater heat pumps are ideal for providing heating and cooling on district heating networks: the optimum arrangement to enable heat recycling and avoid heat losses in the circuit is to use a heat sharing network. A heat sharing network circulates water at ambient ground temperature to a set of buildings, each of which can use groundwater heat pumps to extract heat when they need heating — and reject heat when they need cooling. In a retrofit installation it is likely that a high temperature heat pump will be needed to avoid the need for refurbishing heat distribution systems already in place. Owen Square District Heating: a closed loop system at Easton, Bristol, including summer recharge. The London Aquifer underlies a large area of central London. For larger buildings this permits access to a very large body of water at a more or less constant temperature throughout the year. This is ideal for buildings needing heating by heat pumps or by heat networks which may be able to receive grants from the Heat Networks Investment Project.